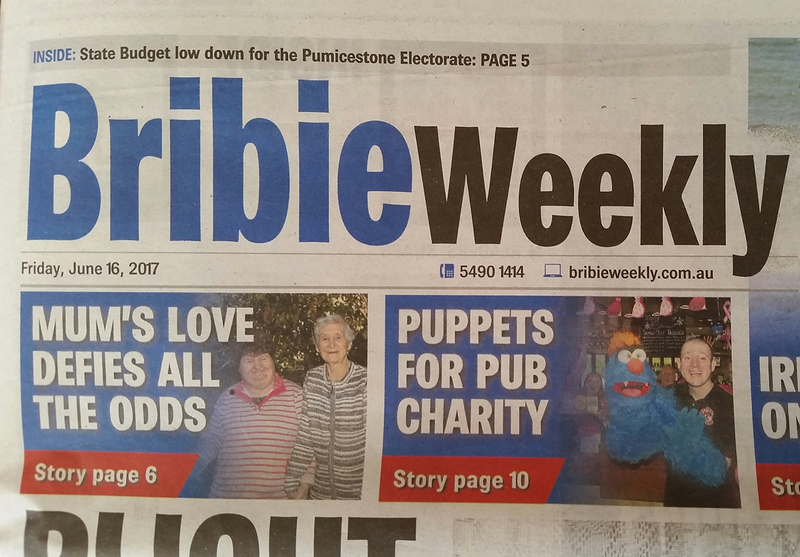 Puppets For Pub Charity: Brett and Troggg appeared in the Bribie Weekly on Friday, June 16 2017. 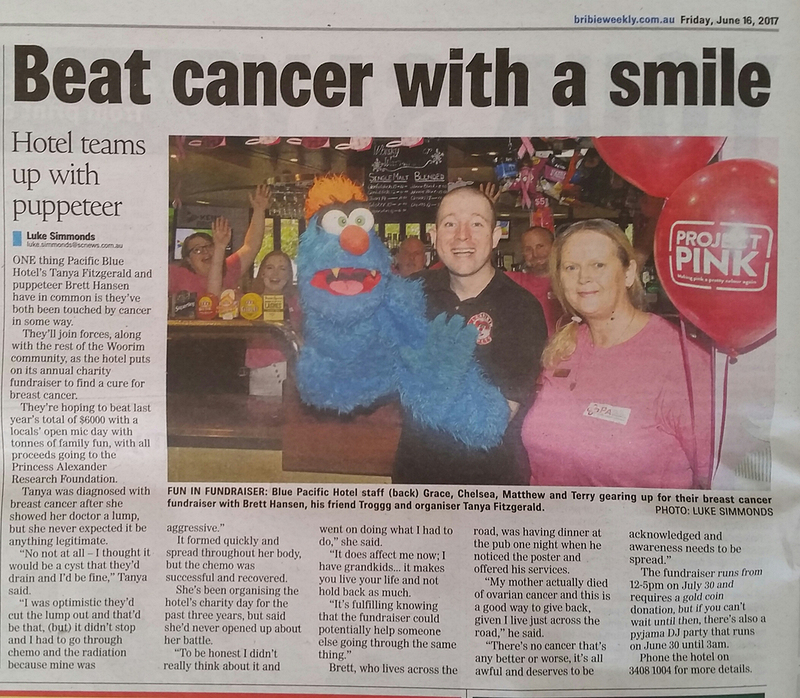 The article talks about the Blue Pacific Hotel’s breast cancer fundraiser and how cancer has touched both the hotel manager and Brett in some way. FUN IN FUNDRAISER: Blue Pacific Hotel staff (back) Grace, Chelsea, Matthew and Terry gearing up for their breast cancer fundraiser with Brett Hansen, his friend Troggg and organiser Tanya Fitzgerald. Photo by Luke Simmonds. 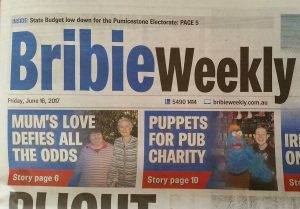 ONE thing Blue Pacific Hotel’s Tanya Fitzgerald and puppeteer Brett Hansen have in common is they’ve both been touched by cancer in some way. They’ll join forces, along with the rest of the Woorim community, as the hotel puts on its annual charity fundraiser to find a cure for breast cancer. They’re hoping to beat last year’s total of $6,000 with a locals’ open mic day with tonnes of family fun, with all proceeds going to the Princess Alexandra Research Foundation. Tanya was diagnosed with breast cancer after she showed her doctor a lump, but she never expected it to be anything legitimate. “No not at all – I thought it would be a cyst that they’d drain and I’d be fine, ” Tanya said. It formed quickly and spread throughout her body, but the chemo was successful and recovered. She’s been organising the hotel’s charity day for the past three years, but said she’d never opened up about her battle. “To be honest I didn’t really think about it and went on doing what I had to do.” she said. “It does affect me now; I have grandkids… it makes you live your life and not hold back as much. Brett, who lives across the road, was having dinner at the pub one night when he noticed the poster and offered his services. “My mother actually died of ovarian cancer and this is a good way to give back, given I live just across the road.” he said. The fundraiser runs from 12-5pm on July 30 and requires a gold coin donation, but if you can’t wait until then, there’s also a pyjama DJ party that runs on June 30 until 3am. Phone the hotel on 3408 1004 for more details.